William Fett of The Godzilla Files reviews the Toho 30cm Series Ebirah Ric Exclusive version vinyl figure by X-Plus. SuperKiss67 provides a look at the new Toho 30cm Series Ebirah Standard Version vinyl figure by X-Plus. This isn’t a review. It’s actually a simple series of camera passes at the figure up-close without audio commentary. This is actually pretty useful if you just want to get a good look at the detail on the figure. The intro is a full minute long (a full 2/5 of the full video), so you may want to scrub ahead to actually see the figure. Shipping Alert! Tired of waiting for the new Toho 30cm Series Ebirah? 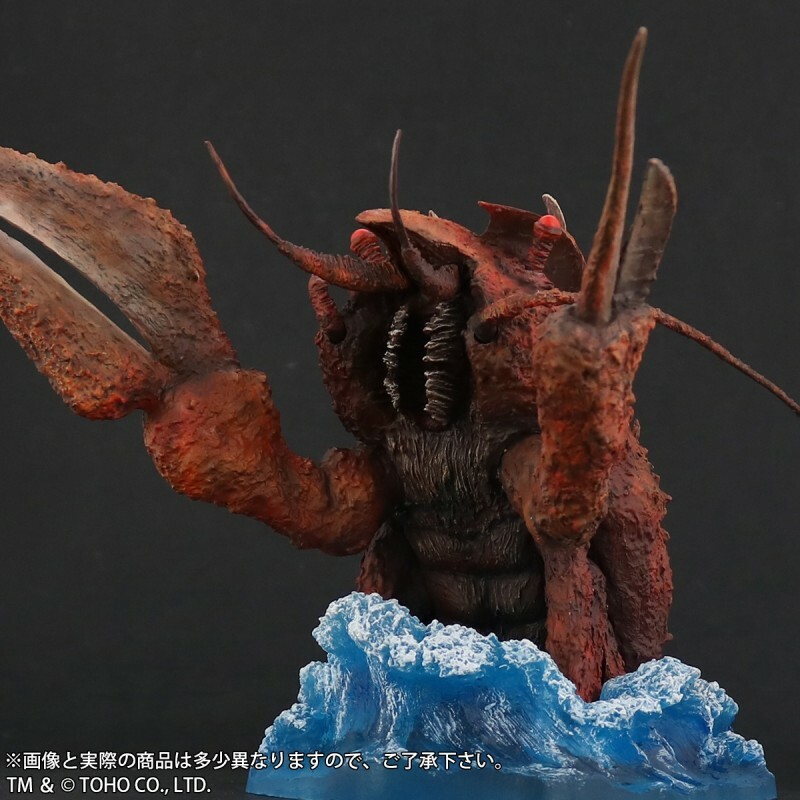 Word on the shores of Letchi Island are that X-Plus will start shipping this crustacean on February 7. Get ready for payment requests from the store your ordered from. If you ordered from us at Flossie’s, you receive an email soon. Rich Eso reviews the Toho Large Monster Series Sanda & Gaira Gargantuas vinyl figure set by X-Plus. Leslie Chambers reviews the Daiei 30cm Series Damajin (大映30㎝シリーズ 大魔神) Standard Version vinyl figure by X-Plus. It was released in November 2016. The Large Monster Series Pestar vinyl figure by X-Plus was released in early 2010. It was later reissued as a Wonder Festival exclusive soft version in July 2011. It’s based on the oil-eating menace, Pestar which was featured in episode 13 (titled Oil S.O.S. / オイルSOS) of the original Ultraman television series which first aired in 1966. 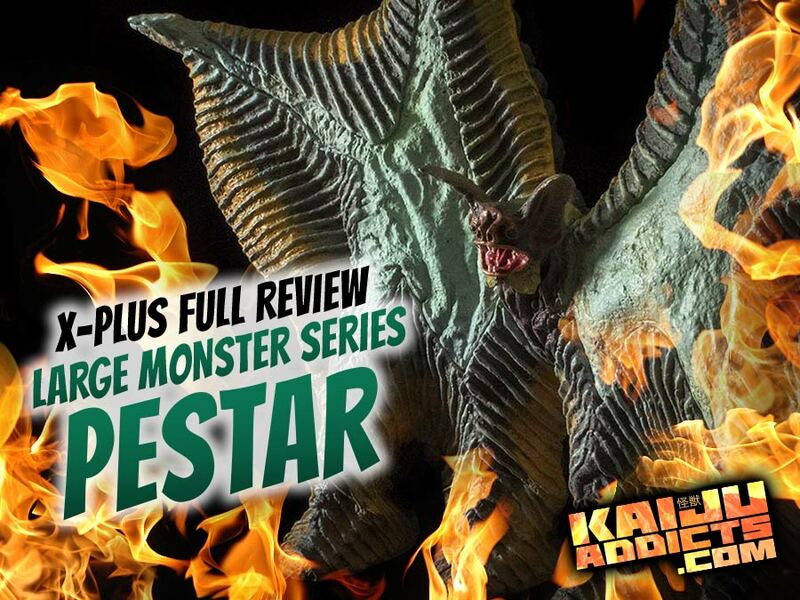 This is the latest Ultra kaiju to join my collection: the Large Monster Series Pestar by X-Plus. I’ve been wanting one for years now. Don’t know why I didn’t pull the trigger until now. The details on this are insane! And it’s a dead ringer for the monster in the original Ultraman series (1966-1967). Every time I look at it I’m flung back to Tilton Street where I lived as a kid; where I watched Ultraman reruns on TV every day. I freaking love these things. Thanks to X-Plus, I finally have the monsters I’ve always wanted. But, hey, we need more Ultraman ’66 monsters, X-Plus! Okay? Leslie Chambers reviews the Gigantic Series Ultraman C-Type (ギガンティックシリーズ 「ウルトラマン（Cタイプ）」) vinyl figure by X-Plus. Ready to get blasted with yet more new releases from X-Plus? There are FIVE new announcements. We’ll address four of them here. See my separate post for Legion. X-Plus has started taking orders for their upcoming Toho 30cm Series Mechagodzilla 1975 based on the giant robot’s appearance in Terror of Mechagodzilla (メカゴジラの逆襲), the final Godzilla film from the Showa era. Though appearing very similar to the 1974 suit (and X-Plus’ 30cm Series 1974 figure) to casual fans, there are some significant differences, most notably the MG2 emblem on each arm and lightning bolt plates on the chest replacing the quarter circle plates from the previous suit. This new 1975 version looks like it has seen more action with stronger wrinkles in the sculpt more generously shadowed with dark paint. Also, this figure does not need a base to stand as the 1974 version does. X-Plus originally stated that this figure would be a mere 27cm tall which had disappointed many collectors. That size, however, was later explained to be an error. X-Plus now states that this figure is a full 30cm tall. It’s not common for X-Plus releases to have articulation. But if this figure is anything at all like it’s predecessor, you’ll be able to move the head, jaw, shoulders, wrists. The door on the chest which hides Mechagodzilla’s energy beam is hinged and will open and close. There will also be some minor give in the legs, especially the feet. The Ric Boy version of this comes with a double dose of exclusive extra features. Firstly, the head can be removed to reveal Mechagodzilla’s electronic brain. And, then there’s the light gimmick. Battery powered lights glow from the figures eyes, chest beam emitter, and electronic brain. The Ric is available from the X-Plus’ online Ric Boy store for ¥22,950 ($216 USD). The preorder cutoff date is July 4, 2016. Shipping is expected to occur in late July / early August. A Standard version will be available, sans the electronic brain and the light, from various online retailers in Japan. You can order one from AmiAmi for ¥16.940 ($159 USD), Hobby Search for ¥16.650 ($157 USD) or Hobby Link Japan for ¥17,575 ($165 USD). • Mechagodzilla’s tail comes separate in the box and must be inserted. • Mechagodzilla lovers hoping for a mechanical trio of all three incarnations, rejoice! Last year X-Plus told us that they hope a Toho 30cm Series Mechagodzilla 2 (from Godzilla vs. Mechagodzilla 2, 1993) will be in the works later this year. On that, X-Plus recently told us to “stay tuned”. 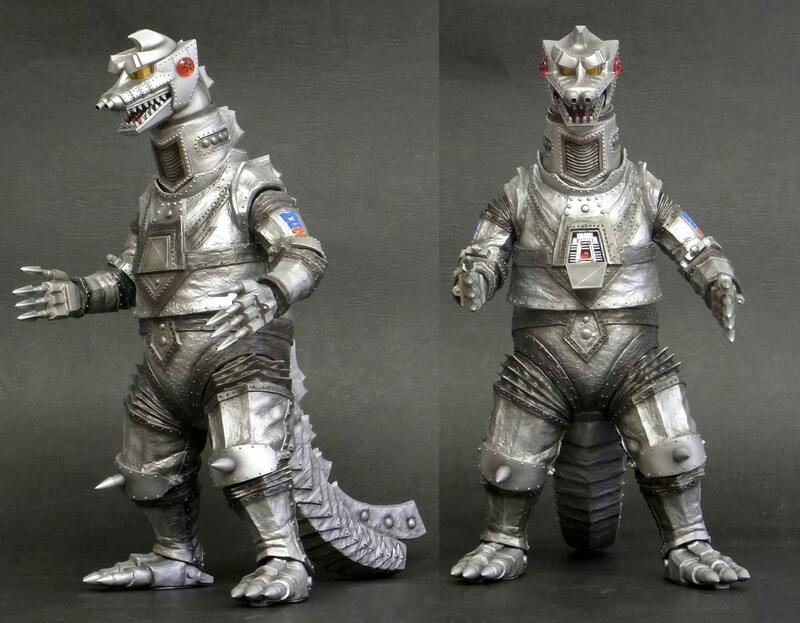 • See high resolution photos of the 30cm Series Mechagodzilla 1975 at SciFi Japan. • See the Kaiju Addicts Review of the similar 30cm Series Mechagodzilla 1974. • Video: Samson West highlights the differences between the 1974 and 1975 suits (using Large Monster Series figures). X-Plus is finally bringing the mutated mantises of Sogell Island to vinyl. Along with Minya and Kumonga, Kamacuras made his debut in Son of Godzilla (怪獣島の決戦 ゴジラの息子), 1967. 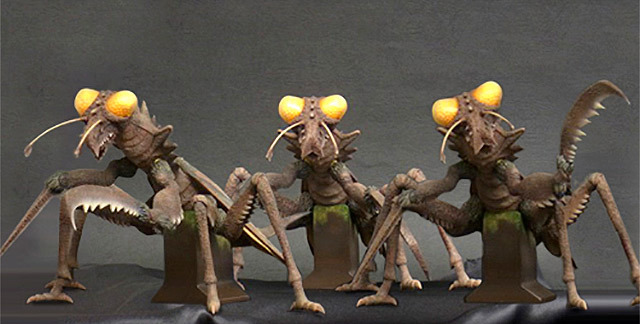 This group of three mischievous insects, already large enough to take down a man, were mutated to kaiju size when Minya’s telepathic cries for a parent interfered with a radioactive weather balloon test. News of this release is fantastic. 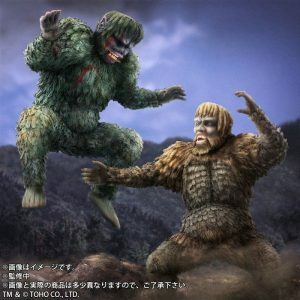 Kumonga collectibles haven’t been made available as often as other characters from the Godzilla franchise. 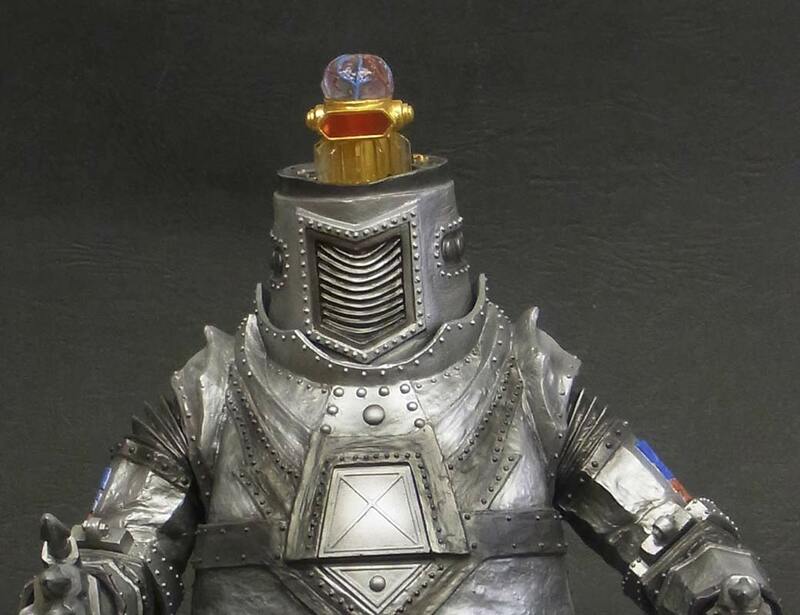 This super-detailed, movie accurate vinyl version from X-Plus will help to fill the void. This release will complete X-Plus’ monster line-up for Son of Godzilla. The Large Monster Series Godzilla 1967 and Large Monster Series Kumonga have already been released. Minya was released with the Ric Boy version of Godzilla. X-Plus states on the Ric site that this figure is 23cm (9 inches) tall. I believe that number is wrong. After all, that’s almost as tall as a Large Monster Series Godzilla. As you can see in the photo above, Kamacuras only comes up to Godzilla 1967’s chest. AmiAmi sets the height of this figure to 16.5cm (6.5 inches). That’s more like it. Before you get disappointed, the size is as it should be. Kamacuras was smaller than Godzilla. It was the gang of three which made them such a menace. AmiAmi says the length will be 30cm (11.8 inches). This little guy suddenly seems more impressive. He’s longer than Godzilla is tall. Keep in mind that Kamacuras is a crawler and like all crawlers, they take up more horizontal space. AmiAmi lists the width (or leg span) of this figure to be 27cm (over 10 1/2 inches). Make no mistake, this bug is going to take up a nice bit of your shelf. Its “footprint” is equal to that of a 30cm Series figure. I wrote earlier that it’s not common for X-Plus releases to have articulation, yet here have another figure that can move. You will be able to rotate each of the grasper front legs at the “shoulder”. 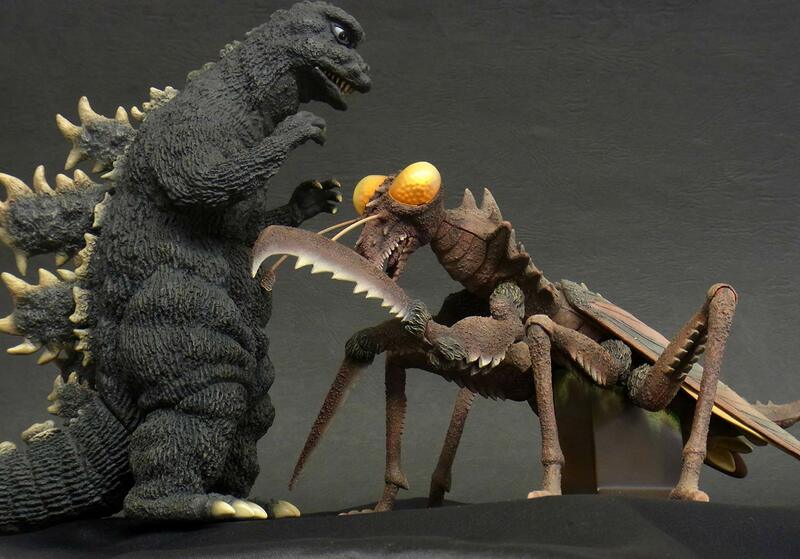 This will make it easier to pose your giant mantis with your Large Monster Series Godzilla 1967 and Minya (if you have ’em). Articulated front legs will also come in very handy for adding variety to your Ric Boy set of three. The Ric is available from the X-Plus’ online Ric Boy store for ¥19,980 ($188 USD). The preorder cutoff date is July 4, 2016. Shipping is expected to occur in late July / early August. A Standard version will be available, which will comprise a single Kamacuras, from various online retailers in Japan. You can order one from AmiAmi for ¥8,470 ($80 USD), Hobby Search for ¥8,325 ($78 USD) or Hobby Link Japan for ¥8,788 ($83 USD). 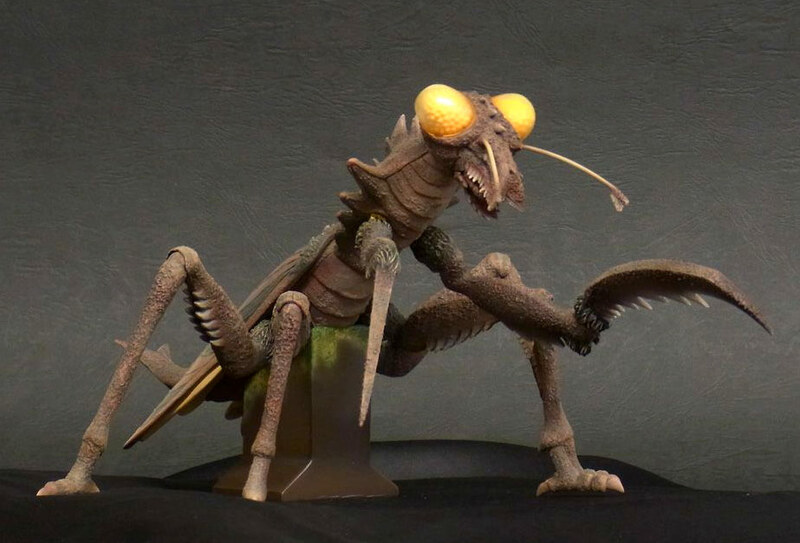 • See high resolution photos of the Large Monster Series Kamacuras at SciFi Japan. • If you are getting the Ric Boy Kamacuras “3-Pack” and already own the Kumonga Ric Boy, then you’ll really have four mantises. Kumonga’s base has a web shrouded Kamacuras built in. 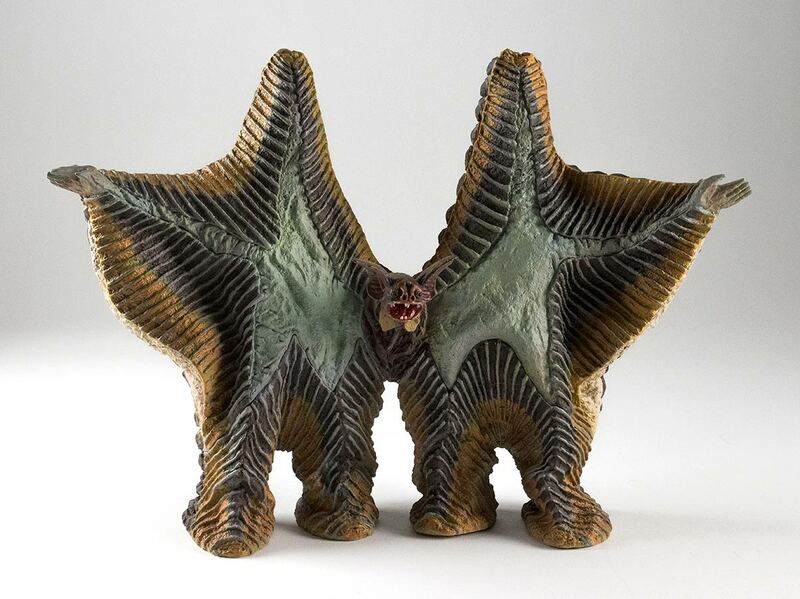 • RELATED: See the Kaiju Addicts Review of the Large Monster Series Kumonga 1967. In episode 18 of the original 1966 Ultraman series, Alien Zarab had disguised himself as Ultraman in an effort to cause unrest among the population of Tokyo. 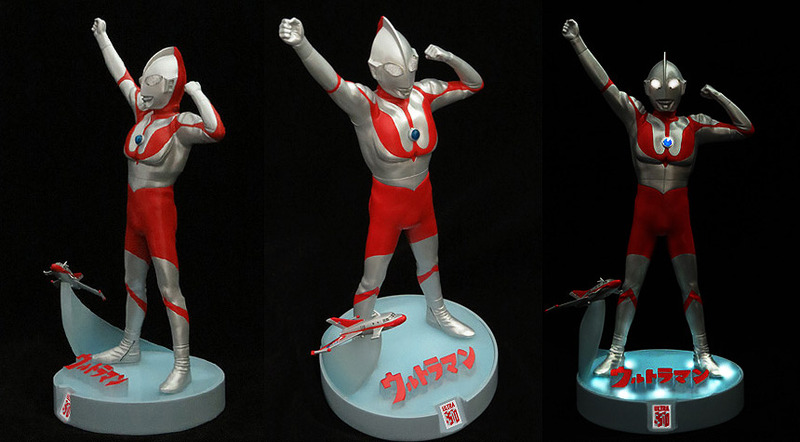 Zarab Seijin’s “fake Ultraman” was released in vinyl previously by X-Plus. This new version sports a darker “nighttime” paint scheme and light gimmick. The figure is approximately 23cm (9 inches) tall and comes with an ABS stand which plugs into one of the feet to power the lights. There does not appear to be a Standard version of this figure. The Ric is available from the X-Plus’ online Ric Boy store for ¥12,960 ($122 USD). The preorder cutoff date is July 4, 2016. Shipping is expected to occur in late July / early August. • See high resolution photos of the Large Monster Series “Fake Ultraman” at SciFi Japan. RMC stands for Real Master Collection and it’s X-Plus’ polystone line. RMC Plus adds light. 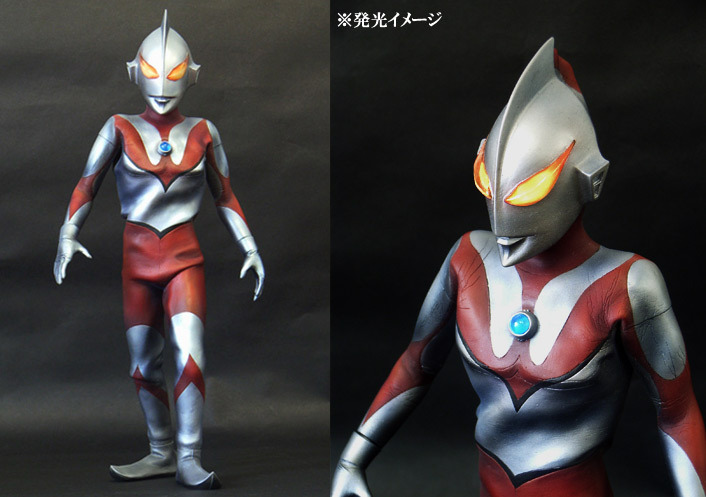 To celebrate fifty years of Ultraman (the original series began in 1966), X-Plus will offer a hard, polystone depiction of Ultraman in his “appearance pose”. It stands atop a polystone base with an extruded Ultraman logo in Japanese as well as the Ultra 50 logo. Hovering near Ultraman’s knee is a Science Patrol Jet VTOL made with PUR (hard plastic). Now, dim the lights and switch on the power. Ultraman’s eyes light up in white, and his color timer in steady blue. (The option to switch to a blinking red light is probably not available since he’s in his appearance pose: just arrived and at full power). It seems the base also emits light. I find it interesting that they chose the C-Type suit for this release. The first series ran, I think, from July 1966 to April 1967. C-Type came last and was seen mostly in 1967. It seems an A-Type would be more appropriate. I’m not complaining though—Type C is my favorite. The height of the figure on the base is about 30.5cm (12 inches) and requires some minor assembly. It will cost ¥19,980 (about $191 USD). As of this writing, the X-Plus Ric Boy Store has not yet begun accepting orders. Also, it seems they will be limited in number. But, they also plan to offer them at unspecified upcoming events. 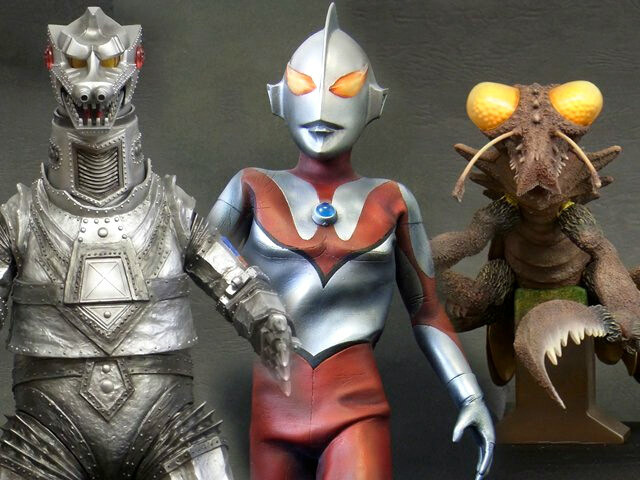 • RELATED: See the Kaiju Addicts Review of the Large Monster Series Ultraman C-Type Appearance Pose vinyl version. 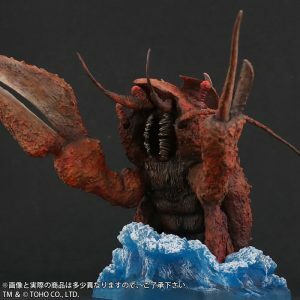 Rich Eso reviews the Large Monster Series Seabozu (大怪獣シリーズ ウルトラマン編 「亡霊怪獣 シーボーズ」) vinyl figure by X-Plus, from the original Ultraman series.